What kind of religion do false teachers teach? First, let's talk about false prophets. In every age there have been false prophets. False prophets look good, but they're deadly. They are on a lot of TV shows today. That's why I'm glad that Lamb & Lion Ministries produces a TV show called Christ in Prophecy that you can actually trust. But, there are a lot of shows out there where you channel surf and you can't trust them because they contain lots of false prophecy. Spiritual deception has been in every age. According to 2 Corinthians 11:4, we are warned about those who preach another Jesus and a different spirit and a different gospel. Scripture gets even more specific. It's not just general warnings we want to deal with. We want to look at the specific prophecies that deal with last day apostasy. And so, let's begin with 2 Timothy 3:1-5, "Realize this that in the last days difficult times will come. For men will be lovers of self, and lovers of money, boastful, arrogant, revilers, disobedient to parents, ungrateful, unholy, unloving, irreconcilable, malicious gossip, without self-control, brutal, haters of good, treacherous, reckless, conceited, lovers of pleasure rather than lovers of God; having the appearance of godliness but denying its power." What we see in this passage among other things is Humanism, Materialism, and Hedonism. Lovers of self is Humanism. Lovers of money is Materialism. Lovers of pleasure is Hedonism. I might mention to you that Materialism and Hedonism are both part of the humanistic worldview. Here's the danger. It's not just adults that I'm worried about. I'm worried about our kids. You see, the public school systems have become bastions of Humanism. They are religious institutions now teaching the false religion of Humanism to our children. This is the kind of garbage that a lot of kids are picking up in their schools. The last days will be characterized as having religion without power, and I think that we see that today. There will be the appearance of godliness, but denying of its power. Do you know what these are? Counterfeits. Some of these counterfeits might make you feel good and build you as up as a human using psychology and other techniques, but the fact is there is no spiritual power there. Counterfeits kind of remind me of Jeremiah 2:13 where back in the Old Testament God told His people, "My people have committed two evils, they have forsaken me the fountain of living waters and hewed out cisterns for themselves, broken cisterns that can hold no water." They forsook God, but they also came up with counterfeit and substitute spiritualties. Do we see substitute spiritualties today? I think that we do. We see people coming up with their own substitute spiritualties, but it shouldn't be. Second Timothy 4:3-5 tells us this, "The time is coming when people will not endure sound doctrine but having itching ears they will accumulate for themselves teachers to suit their own passions and will turn away from listening to the truth and wander off into myths." Sugar coated preaching is dangerous to your soul. This next Sunday morning I can promise you there's going to be a lot of sugar across this nation. All across this nation there is going to be sugar coated preaching. We need to return to the Word of God. God in the end times (2 Timothy 3:4-5). Christ's return (2 Peter 3:3-4). sound doctrine (2 Timothy 4:3-4). morals as we've got a moral crisis (2 Timothy 3:1-8). authority, now especially among our young (2 Timothy 3:4). This is what we're going to see in the end times according to this brief survey of Scripture. There's also going to be false prophets that seem like true prophets. There will be false gospels contrary to the biblical Gospel. There will be false concepts of Jesus Christ, substitute spiritualties, a departure from sound teaching, the embracing of religious myths, a form of godliness without true spiritual power, Humanism, Materialism, and Hedonism. That's bad news, but that's the bad news that we are going to focus on. 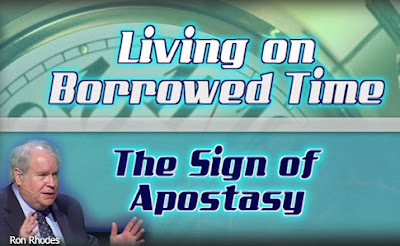 In the third segment of Dr. Ron Rhodes teaching on apostasy as an end times sign, he will explain what the current apostasy looks like that's against the Bible and doctrine.